Christmas lasts a good week around here. It's crazy good. Tonight was Christmas at Grandma and Grandpa's house. Saturday is Christmas at Aunt Poonie's. Sunday is real Christmas which will be at our house, and after that we're heading up to Gramps and Beanie's to have Christmas for a few more days with all the relatives. It's a jolly time. Anywho, after Christmas dinner tonight, Grandma and Grandpa gave us our Christmas presents. My little three-year-old sister Cookie got a new doll. "What are you going to name it?" Grandma asked. "Cupcake" was her immediate response. Cookie names EVERYTHING Cupcake. In fact, the other day I was playing "squinkies" with her and she had like five hundred of them and she named every single one of them Cupcake. Except for one unicorn. His name was Roger. That was a confusing game. Every time my little panda dude was trying to talk to one of the Cupcakes, all the rest would always answer. So he ended up ignoring all the Cupcakes and only talking to Roger. Okay, down to business. Let's talk buckeyes. You probably think they're really hard to make. Well, you're wrong. I used to think that too before I got awesome. 1. Make sure your peanut butter dough is really thick. You don't want your balls to flop. 2. When you're melting your chocolate chips, make sure you add peanut butter to them first and turn the microwave heat down by 50%. Your chocolate will melt perfectly every time. 3. Freeze your balls of peanut butter until they're solid. Otherwise they're hard to dip. 4. If your chocolate starts to cool, just throw it back in the microwave for thirty seconds. It will remove oodles of stress from your life. Beat together the butter, peanut butter, salt, and vanilla. Add the powdered sugar 1/2 cup at a time until the mixture is thick and doughy. You might have to kneed the last bit in with your hands. If the dough is still a little soft for rolling into balls, throw it in the freezer for 20 minutes. Line a baking sheet with parchment paper. Roll the dough into small, round balls (whatever size you want) and spread out on the baking sheet. Stick a toothpick all the way through the center of each one and then freeze them for at least 20 minutes or until they're solid. Mix together the chocolate chips and 1/4 cup of peanut butter. Turn your microwave power down by about 50% and microwave at 45 second intervals, stirring each time until smooth. 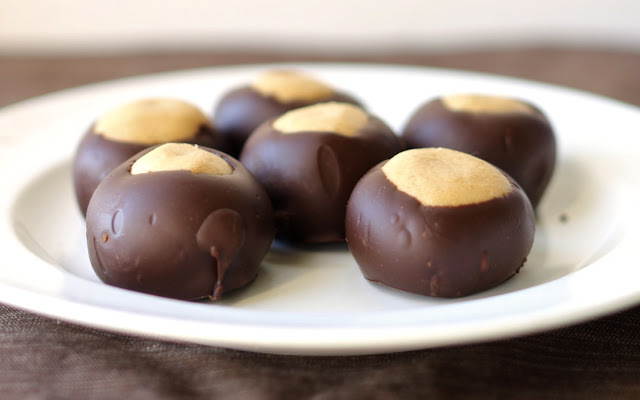 Dip each peanut butter ball into the chocolate, leaving a little circle on the top that's not coated. Place them back on the sheet. Remove the toothpicks and smooth over the hole with your finger. Can be refrigerated, but don't have to be. "Ho ho, Yammie! Looks like someone's been a good girl this year. I think I'll get you an iPhone and a black convertible. And what's that? You want a lifetime supply of Lindt truffles? Of course!"